Sportsmen. 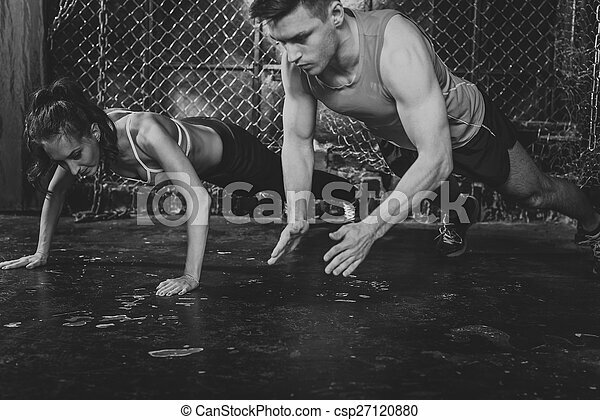 fit male trainer man and woman doing clapping push-ups explosive strength training concept crossfit fitness workout strenght power. 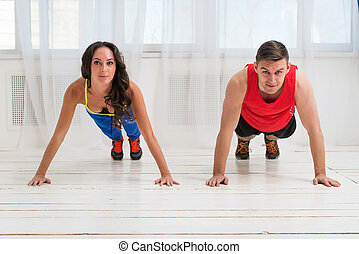 fit sportive man and woman doing plank core exercise training back and press muscles concept gym sport sportsman crossfit fitness workout strenght power. Young woman doing streching exercises with man smiling looking at camera concept training exercising workout fitness aerobic. Active sportive man doing abdominal exercises crunches on floor in gym with the help of woman concept training exercising workout fitness aerobic. Active sportive woman stretching doing exercises aerobics or warming up with gymnastics for flexibility young man helping holding her leg. Active athletic sportive woman girl and man showing their muscles biceps healthy lifestyle. 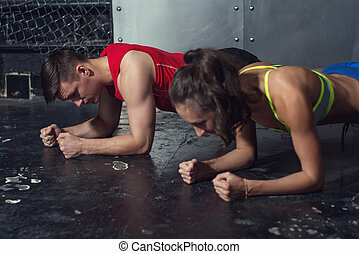 Active athletic sportive woman girl and man showing their muscles biceps healthy lifestyle looking at camera.